HANDURAW pulong nga na mugna alang sa atong paghandum sa adlawng natawhan ni Arsobispo Teofilo Camomot. - Higala ni Teofilo Core Group. March 3, 2016 - 10:00 PM - Pontifical Mass with Abp. Jose S. Palma, D.D. 4:00 PM - Eucharistic Celebration with Abp. Jose S. Palma, D.D. at IEC Pavillion. Mga higala let’s celebrate with thanksgiving the 103rd birthday of our dear Servant of God Abp. Teofilo Camomot. Eucharistic celebrations will be at the DST Chapel, Valladolid, Carcar City, Cebu. The 1st AwiTeofilo 2017 Original Song Writing Festival The presentation night will be on March 3, 2017, 7:30 P.M. at the DST Compound (new museum site), Garietta Heights, Valladolid, Carcar City, Cebu. 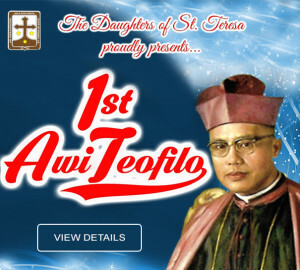 Mga Higala ni Teofilo, you are cordially invited on the 29th Death Anniversary of our beloved Archbishop Teofilo B. Camomot. Please invite also your relatives and friends. 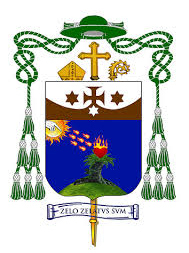 Venue of Masses will be at the Daughters of Saint Teresa Chapel, Valladolid, Carcar City, Cebu. Daghang Salamat!!! 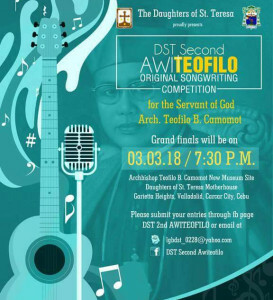 DST 2nd AwiTeofilo 2018 Original Song Writing Festival The presentation night will be on March 3, 2017, 7:30 P.M. at the DST Compound (new museum site), Garietta Heights, Valladolid, Carcar City, Cebu. Mga Higala ni Teofilo, you are cordially invited on the 30th Death Anniversary of our beloved Archbishop Teofilo B. Camomot. Please invite also your relatives and friends. Venue of Masses will be at the Daughters of Saint Teresa Chapel, Valladolid, Carcar City, Cebu. Daghang Salamat!! !